If you’ve been following the OCDE Newsroom this morning you know that the Orange County Department of Education is announcing the county’s 2016 Teachers of the Year today. The “prize patrol” includes OCDE administrators and sponsors who are handing out prizes including Disney park passes, and SchoolsFirst Federal Credit Union is presenting each winner with a $500 check. Each teacher will also receive a $15,000 prize from the Dr. James Hines Foundation, established by OC residents Bill and Sue Gross, at a dinner gala in November at the Disneyland Hotel. We now bring you the final winner, the community college Teacher of the Year, Dr. Karah Street. 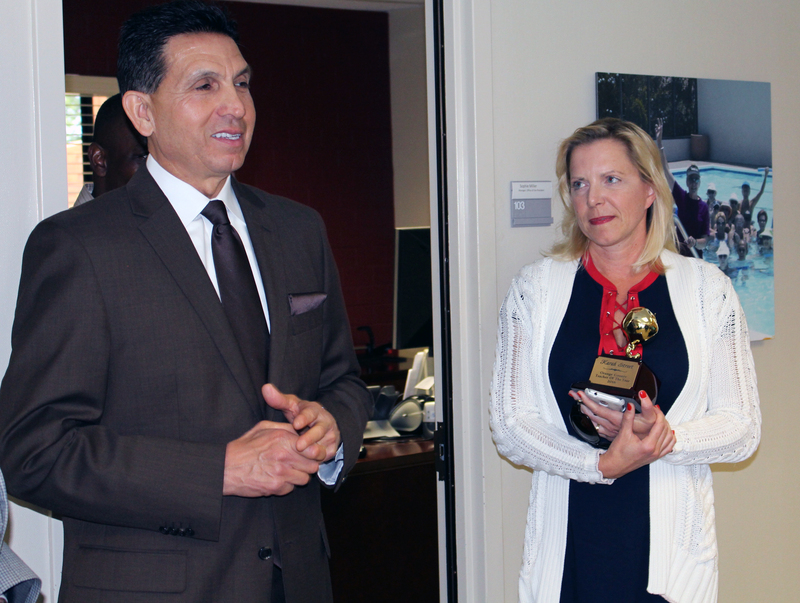 In an administrative building on the campus of Saddleback College, county Superintendent Dr. Al Mijares surprised the fifth and final Orange County Teacher of the Year, Dr. Karah Street. Dr. Street had been in a meeting with Saddleback President Dr. Tod Burnett and Dean Chris McDonald as a small crowd gathered quietly in the lobby. 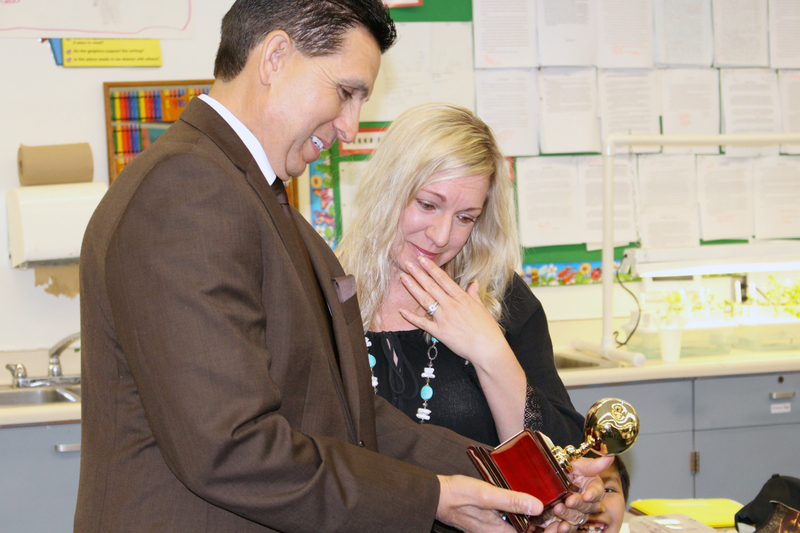 When she emerged, she was greeted by Dr. Mijares, who handed over the last Golden Apple. “If we had more people like you, we’d be even farther along than we are today,” the superintendent said. As a professor of biological sciences at Saddleback College in the South Orange County Community College District, Dr Street says getting students to open their science textbooks is the first challenge, and she’s humble enough to recognize that students will retain only a fraction of the science content they learn in her class. Which is perhaps why she references the work of psychologist Lev Vygotsky and describes her “real” role as an educator to be “a more knowledgeable other.” For Dr. Street, that means being a mentor who shares her personal experiences, perspectives and knowledge to impart the life skills that she hopes her students will carry for the rest of their lives — while guiding their learning of science. And she finds that those life lessons are what affect the young adults she teaches the most. Today we’re following along as the Orange County Department of Education announces the county’s five Teachers of the Year for 2016. The “prize patrol,” comprising a yellow school bus carrying OCDE administrators, media and sponsors, is surprising most of the winners in their classrooms. Disney is presenting each teacher with a prize package including park passes and merchandise, and the SchoolsFirst Federal Credit Union is giving each a $500 check, along with a lunch bag and pen set. Finalists will be honored at a dinner gala in November at the Disneyland Hotel, where they’ll will receive a $15,000 prize from the Dr. James Hines Foundation established by OC residents Bill and Sue Gross. We now bring you the next teacher honored this morning, Janis Leach. Flanked by Tustin Unified Superintendent Dr. Gregory Franklin, Tustin Public Schools Foundation representatives and district and county officials, county Superintendent of Schools Dr. Al Mijares paid a visit to “Leachville,” better known as the classroom of Mrs. Janis Leach, to deliver the next Golden Apple. Mrs. Leach teaches a second- and third-grade combination class at Arroyo Elementary School in the Tustin Unified School District. As the self-proclaimed Mayor of Leachville, she has created a classroom environment based on the social science standards on community studies. Her students are “residents,” responsible for their “homes” – also known as their desks – and they proudly put in a hard day’s work to make the community of Leachville successful. This model has created a feeling of belonging and true connectedness for the students, and parents report that their children learn a sense of responsibility through the experience. Mrs. Leach believes rigorous learning environments increase student engagement and achievement. She is credited with bringing new mathematics instruction to her classroom and school, and she’s lauded for her use of technology in her teaching. 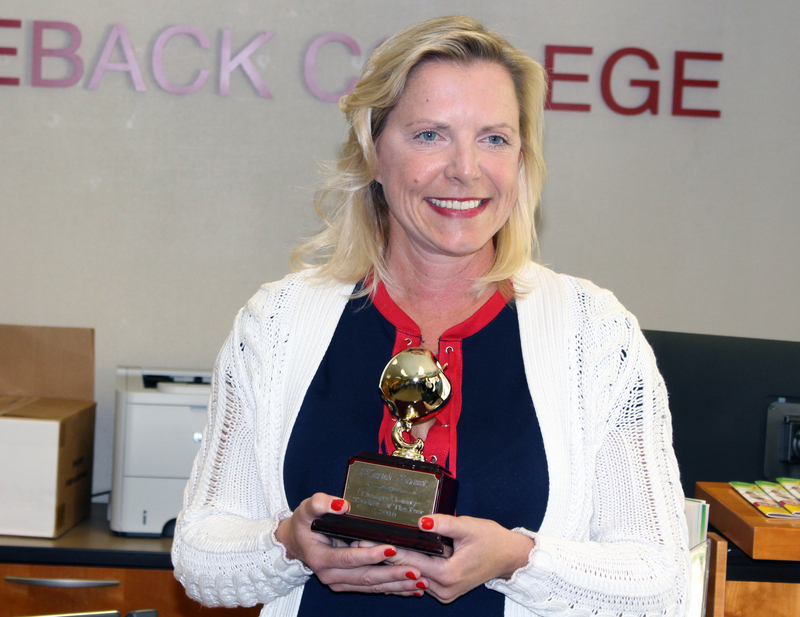 “Wherever there is student engagement, rigorous learning and innovative technology you can expect to find Mrs. Leach,” one colleague wrote. It wasn’t long before her class broke into their well-known Leachville cheer. Leach told students that they played a big role in her recognition. “I really think a lot of it is because of you, my fabulous, amazing students, who push me to make learning fun,” she said. This morning, the Orange County Department of Education and a handful of program sponsors have been visiting schools to announce the 2016 Orange County Teachers of the Year. Disney sponsors have been presenting the honorees with park passes and merchandise, and the SchoolsFirst Federal Credit Union has a $500 check on hand for each teacher. Finalists will also receive a $15,000 prize from the Dr. James Hines Foundation, established by OC residents Bill and Sue Gross, at a November dinner at the Disneyland Hotel. And here at the Newsroom, we’re following the announcements and bringing you information on the winners. Here’s the story of Natalie Carias. 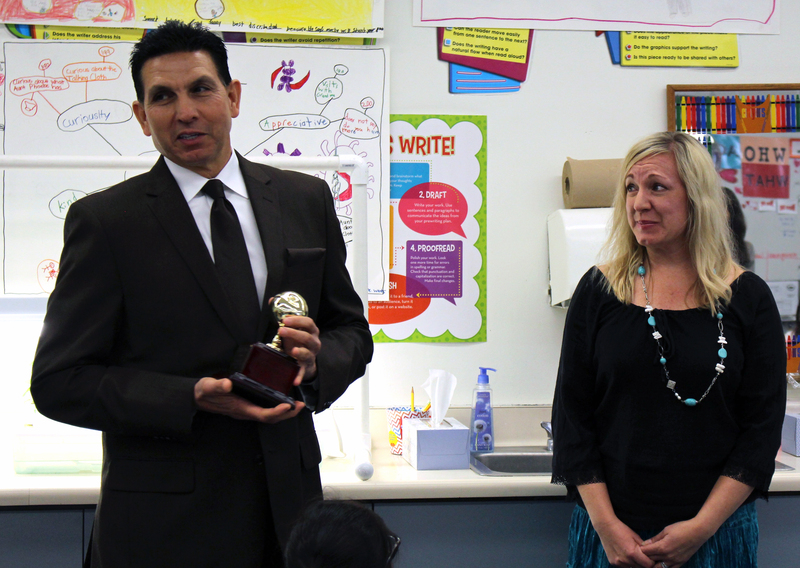 In a Crescent Elementary School classroom adorned with student artwork and writing, county Superintendent of Schools Dr. Al Mijares presented the next Golden Apple to Mrs. Natalie Carias as her students cheered on. Also in attendance were Orange Unified Superintendent Michael Christensen and Principal Randi Leach. Carias is a third-grade GATE teacher at Crescent, which is in the Orange Unified School District. She’s implemented a pilot program utilizing an innovative co-teaching model, allowing students to benefit from the expertise of two teachers. Mrs. Carias strives to create a student-centered environment in her classroom and considers that her greatest accomplishment. Upon receiving the Disney gift bag, Carias joked that perhaps a field trip to Disneyland was in order. “Yay!”, the class of third-graders shouted in unison. The “prize patrol” bus loaded with OCDE administrators, media and sponsors continued its journey announcing the five 2016 Orange County Teachers of the Year this morning. Sponsors are on hand with prizes including Disney park passes and a $500 check from SchoolsFirst Federal Credit Union. Each winner will also receive a $15,000 prize from the Dr. James Hines Foundation, established by OC residents Bill and Sue Gross, at a dinner in the teachers’ honor in November at the Disneyland Hotel. We now bring you the story of the next winner: Sharon Romeo. 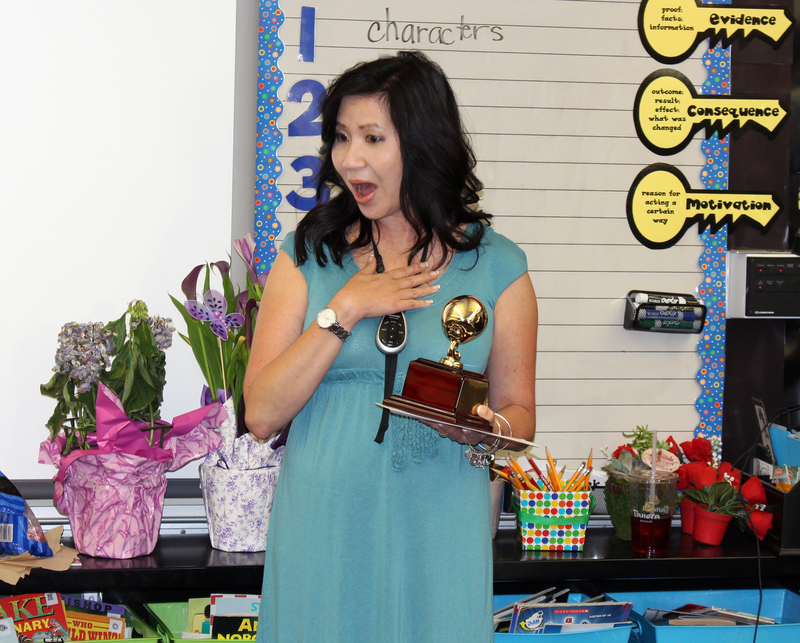 Applause broke out in Ms. Romeo’s classroom as county Superintendent of Schools Dr. Al Mijares presented her with the next Golden Apple shortly before 9:30 a.m. This time the pack of well-wishers included Santa Ana Unified Superintendent Dr. Rick Miller and Mendez Fundamental Intermediate Principal Dennis Cole, who shared the good news over the school’s PA.
Romeo, who admitted to being shocked, quickly deferred the credit. Romeo, a language arts teacher at Mendez in the Santa Ana Unified School District, is known for her unwavering belief that curriculum should be rigorous and challenging, and she melds compassion with high expectations. Reflecting on the issues facing students from low-income households, Ms. Romeo stresses that poverty is not only limited to financial resources. “A student can be impoverished mentally through lack of rigor in the schools, physically through lack of nutrition and spiritually through the hopelessness that poverty provides in abundance,” she says. Today, the Orange County Department of Education is announcing the county’s five Teachers of the Year for 2016. In the next few posts, we’ll be sharing information about the winners and the qualities that make each a great teacher. Let’s begin with Lisa Moloney, a second-grade teacher at Perry Elementary School in the Huntington Beach City School District. This was the first stop for the “prize patrol” caravan of OCDE officials, media and sponsors. Shortly after 8:20 a.m., a throng of visitors entered Room 12 at Perry Elementary School. 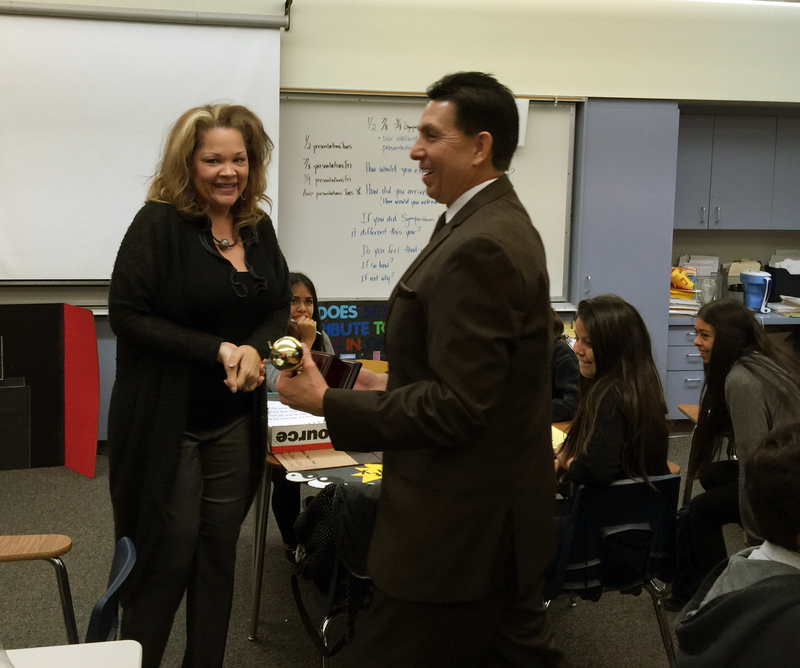 Dr. Al Mijares, Orange County superintendent of schools, led the way and congratulated Mrs. Lisa Moloney as an Orange County Teacher of the Year. Disney representatives followed, presenting a prize package with park passes and merchandise. SchoolsFirst Federal Credit Union handed out a $500 check along with a lunch bag and pen set. Also on hand were Huntington Beach City School District Superintendent Gregory Haulk and Perry Elementary Principal Renee Polk. “We have more than 20,000 teachers in this county, and she is being recognized as one of the five finalists, so this is an amazing accomplishment,” Dr. Mijares told her students. 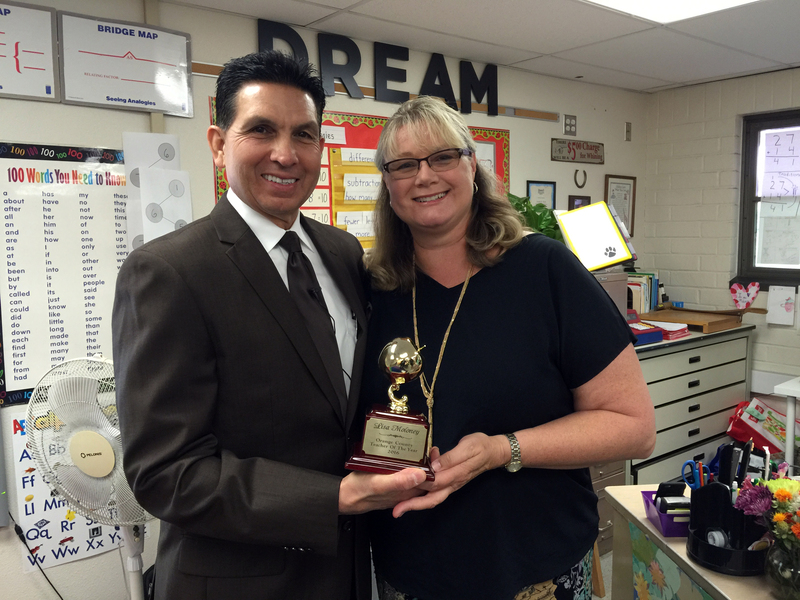 Mrs. Moloney consciously works to make her classroom a safe place for students, where her No. 1 rule is “No stress.” By creating a warm and inviting environment in her classroom, students are able to flourish and have fun while learning. When students do need to be redirected, she employs sign language to give visual support while protecting their privacy. It’s another way in which she expresses her respect and love for the young scholars in her charge.